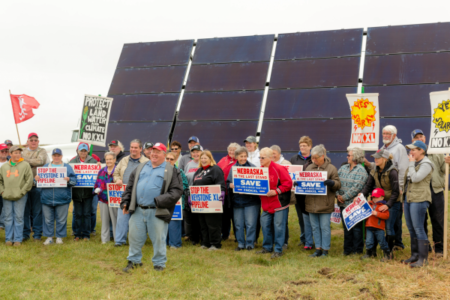 The “Solar XL” project has completed another installation of solar panels with Nebraska landowners in the path of the proposed Keystone XL pipeline — on the family land of Diana and Byron “Stix” Steskal that they named Prairierose Farm, near Atkinson. The family partnered with Solar XL project sponsors Bold Nebraska, 350.org, Indigenous Environmental Network, CREDO and Oil Change International to put renewable energy directly in the pipeline’s path. Read more here. This entry was posted in Nebraska / Midwest News and tagged 350.org, Bold Nebraska, CREDO, Indigenous Environmental Network, Oil Change International, renewable energy advocacy / activist groups, solar energy development in Nebraska, solar XL on September 21, 2017 by Helen Deffenbacher.